We supply steel, high grade stainless steel and solid plastic cable carriers and plastic cable carriers with aluminium stays (Hybrid cable carriers), in standard sizes or tailor made to an individual customer’s requirements in millimeter units. Our scope of supply ranges from small units of only a few millimeters as for an inkjet printer to giant chains for oil platforms where the chain weighs several tonnes. 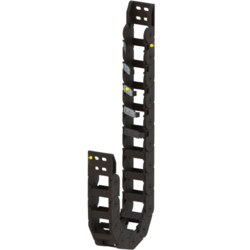 With properties suited to all application situations, for example stable and robust, with fixed chain widths or variable widths, for long unsupported lengths and 3D applications. Particularly quiet and lightweight, in a covered design and quickly open-able. Or for extreme conditions, for example heat-resistant or suitable for clean room environments. Our company has established itself as a leading distributor and supplier of superior quality Solid Plastic Cable Carriers. These are used to connect one network device to other network devices or to connect two or more computers to share printer, scanner etc. Different types of network cables like Coaxial cable, Optical fiber cable, Twisted Pair cables are used depending on the network's topology, protocol and size. These are made available to the customers at industry leading rates and are provided as per the set industry norms and protocols as well. 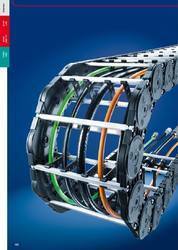 As an ace distributor and supplier of Covered Cable Carrier, we have marked our name very strongly in the market. We offer these after multiple runs of quality checks. The conductor is made of electrolytic grade, bright annealed bare solid copper conductor of 0.45/ 0.5 mm diameter and is insulated with a special grade polyethylene compound on the latest state-of-the-art extruders. The cores are twisted together with a uniform lay on a special purpose imported machine, according to the color code to form pairs. 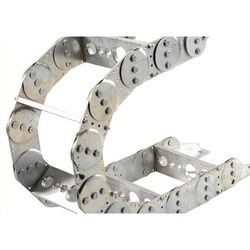 We are recognized as a successful distributors and suppliers of Steel Cable Drag Chain in the market at present. The cores are twisted together with a uniform lay on a special purpose imported machine, according to the color code to form pairs. The pairs are bunched together in such a manner so as to minimize cross talk. The cable is then jacketed with a specially formulated PVC compound with fire retarding properties. 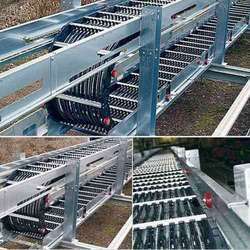 These are made available to the customers at industry leading rates and are provided as per the set industry norms and protocols as well. 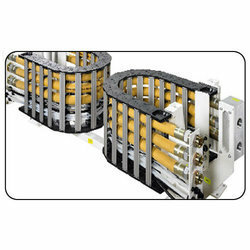 Inside heights Multivariable cable carrier with extensive accessories and stay variants* Aluminum stays with ball joint Can be opened quickly on the inside and the outside for cable laying Aluminum stays available in 1 mm width sections Plastic stays available in 4, 8 or 16 mm width sections C-Rail for strain relief elements Locking bolts Enclosed stop system not sensitive to dirt/contamination Plastic cover available in 8 or 16 mm width sections Replaceable glide shoes Large choice of stay systems and ways of separating the cables Extremely robust due to stable plate construction Minimized hinge.. 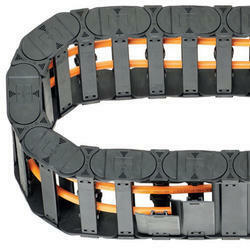 Looking for Kabelschleep Cabel Carrier Systems Drag Chain ?